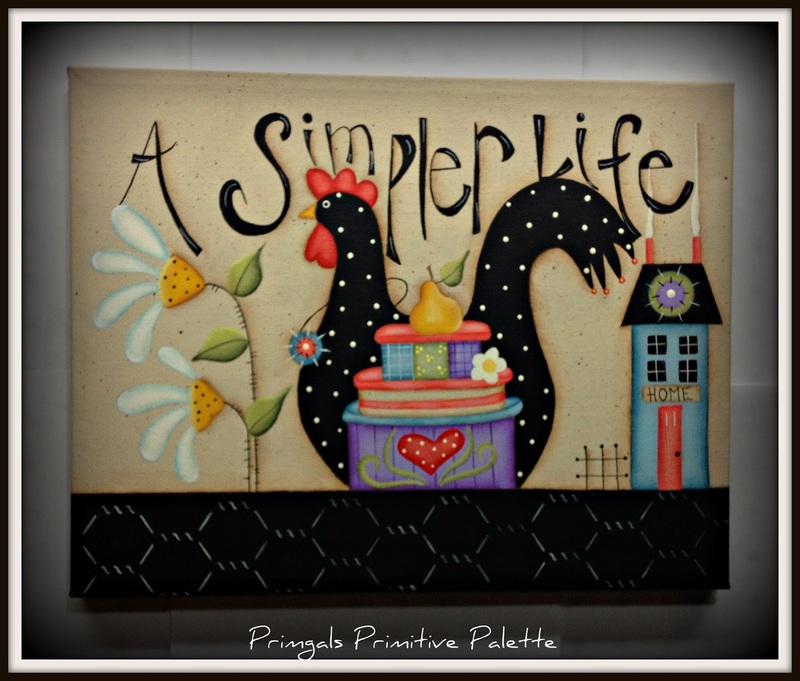 I have been dabbling with painting larger canvas pieces and I LOVE IT! Lots of time involved but it allows so much more to the creative process. This design by Terrye French/Deb Antonick was a challenge for me to step out of my comfort zone and play with brighter colors. Such a fun piece to paint! 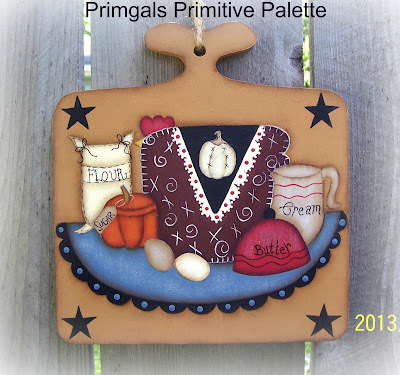 I had such a wonderful time painting this design from Monika Brint. I have been wanting to do one of her designs for such a long time! This piece has already sold, but I have a wonderful customer that just sent me a sled to paint, and Monika's snowmen will be perfect! It has been such a long time since I have posted to my blog! Like all good intentions I hope to do much better in the coming months. I can hardly believe that it is time for Christmas painting already......as I am still enjoying the beautiful weather and colors of fall. 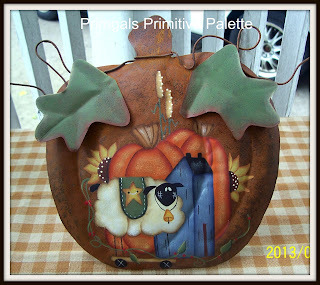 I found this old metal coal shovel at an estate sale and had such fun painting it. I love this Santa by Cyndi Combs and I think it fit this surface wonderfully! 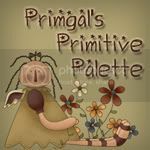 For those of you that are new to my blog, all of my painted creations can be found in my Etsy shop! Some of my items are One of A Kind creations such as the Santa shovel, but many can be reproduced so never hesitate to ask! Wishing you all a wonderful week.........till next time........God Bless! 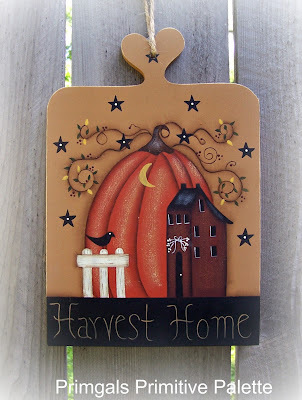 It won't be long now and we will be getting ready to decorate for Fall. 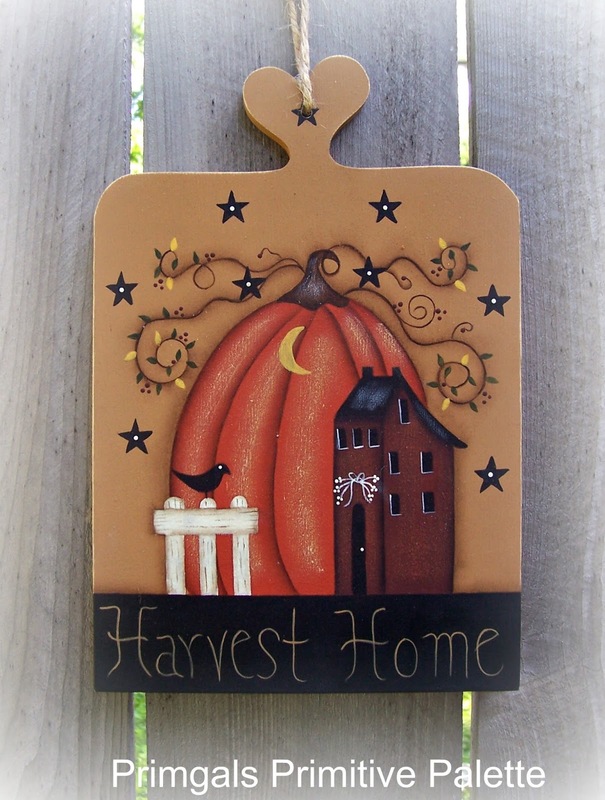 Everyone knows that is my favorite time of year, and most of all my favorite season to paint. I just love the warm color palette of browns, golds, and deep oranges. I can't wait for the sweatshirts, crunching leaves, and the glorious crisp mornings! 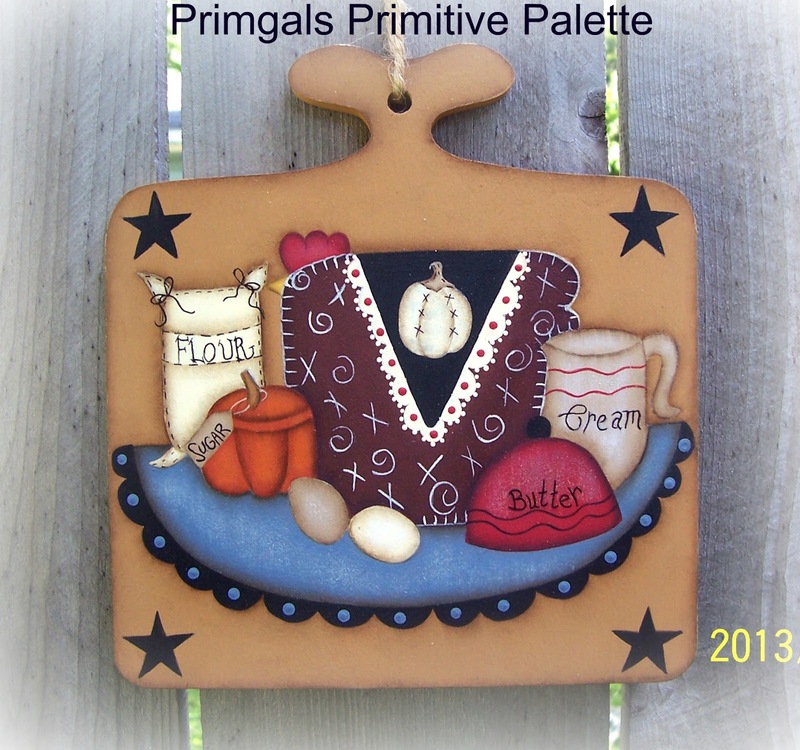 The items that I have to show you today are all patterns done by Martha Smalley. They can be purchased in her Etsy shop or on the Painting With Friends website! 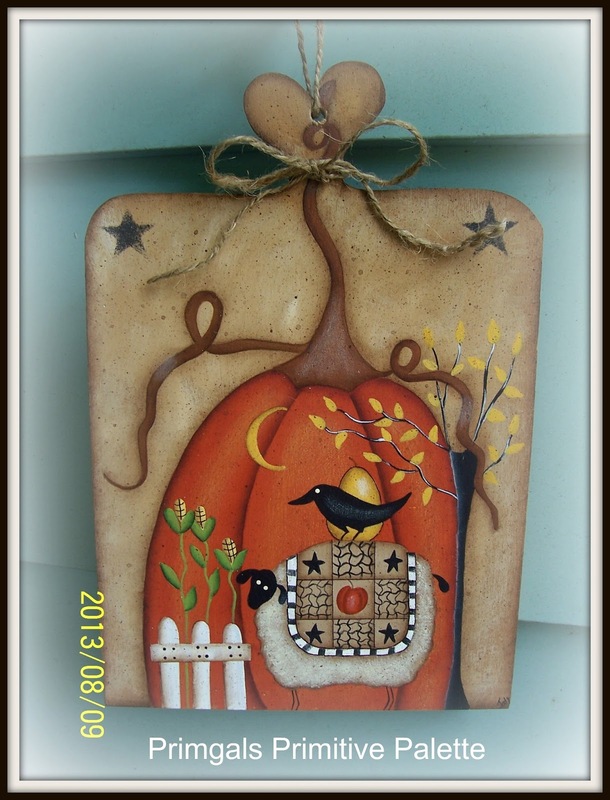 If you love chickens, then this would make a great addition to your collection for Fall! Anyone up for Pumpkin Pancakes? I did a texture technique of beiges and whites to give the background some depth. Martha used a beautiful stencil on hers, but since I didn't have one handy I improvised......:) I just love the sheep's blanket! I so hope you are enjoying these last days of summer! After such a long time of not blogging, I am delighted to return. Life happens and found I needed to step away for a time, and get priorities in order. I am hoping in the next few days to catch up with you all and visit your wonderful blogs.......I have missed so much! 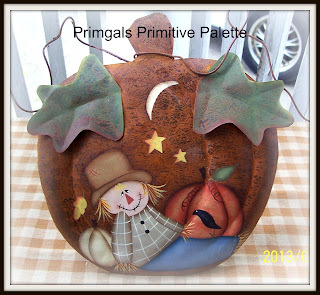 Although it is the end of July it has been time to start painting for Fall. As always so many things to paint and so little time to do it all. 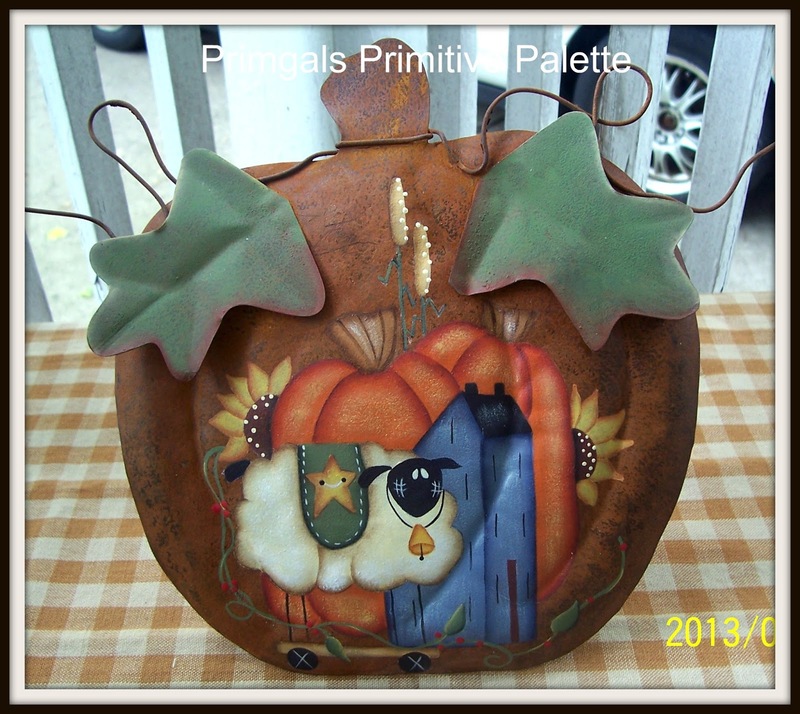 But I wanted to share a couple rusty tin pumpkins that I have completed to get the season started. This one is a Renee Mullins design. This sweet scarecrow couldn't scare anyone least of all the crow on his pants! I love working with Marie Provost designs.....they are always so very sweet! 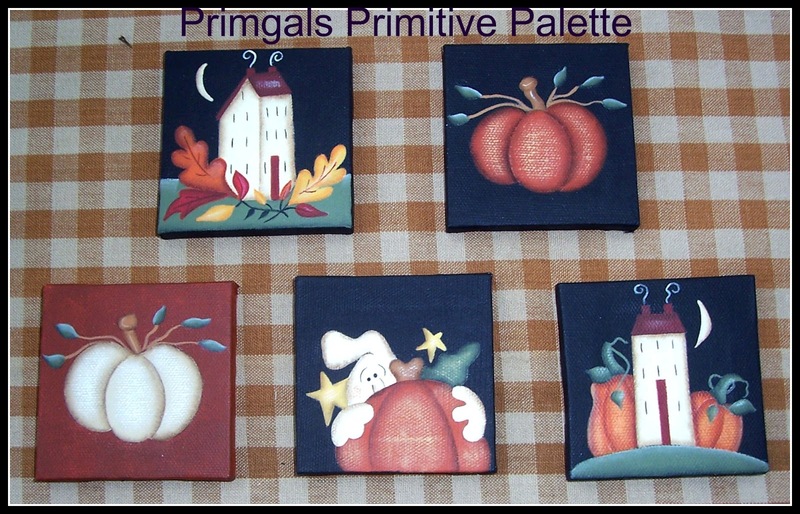 I have some work to finish on these little mini canvases but wanted to share. 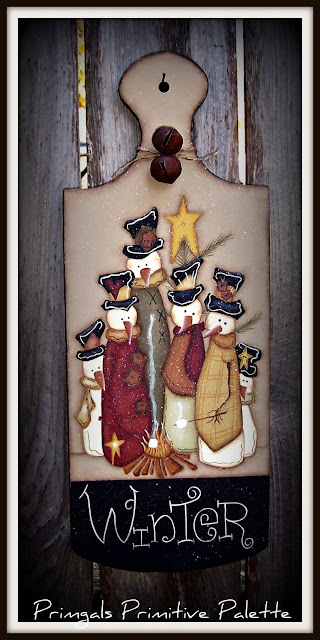 I make them into ornaments for theme trees, or they can be used for basket ties, or added to cabinet doors for the season. I still need to add the eye hooks and hangers and add them to my Etsy shop. 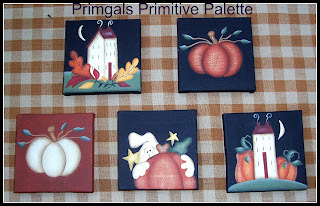 I hope you have enjoyed my new items.......and it is great to be back painting on a regular basis. I will have many more things to show you so I hope you are a frequent visitor!